When you look at your home either after you buy it or after you’ve lived in it for awhile you start to see items that need to be updated inside and out. This is natural because nothing lasts forever. Most people like to start with the inside because this is what they see when they come in the door. This is not usually what saves them money on their utility bills. Let’s start a list below of the items Culpeper Window & Siding, Inc. can help you with this year! 1. Entry Doors – We install Entry Doors & Patio Doors. We use ProVia Doors we use them in our own home and they have a lifetime warranty. 2. Windows – Replacement Windows do not last forever! I’ve have personal made the mistake of buying from a local hardware store my windows in the past and I had a carpenter install them. My carpenter was my dad so he did it the right way! It’s the quality of the windows not the craftsmanship! I did not realize they were not the same quality as Culpeper Window & Siding, Inc. windows! Did you know that if you do not buy the proper windows they will make your floors, drapery, furniture and more fade over time! Our low-E, double hung windows with or without grids are easy to clean and very affordable. Yes, they cost more than your local hardware store but in the end you do not have the replace them in 5 years! We have Vinyl Windows, Historic Windows, Bay and Bow Windows, Picture Windows, Double-Hung Windows, Wood Windows & Aluminum Clad Windows. 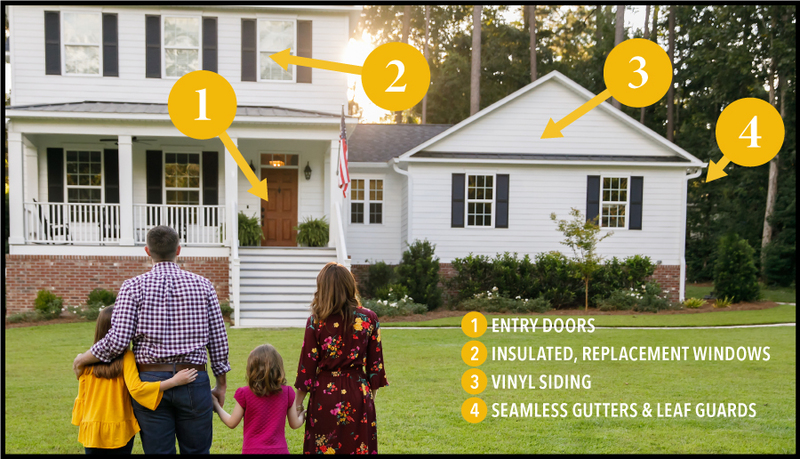 3 – Vinyl Siding – If you check out March blog on facebook I talked about Vinyl Siding. Vinyl Siding has to be one of the lowest maintenance products out in the market today! You do not have to paint anymore! After spending years painting several houses this is a BLESSING! You can install Vinyl Siding at any time as long as it’s not raining or below freezing! 4 – Seamless Gutters & Leaf Guards – These are huge with anyone who has trees anywhere near their homes! If you are going to pay for gutters, my recommendation is to install the Leaf Guards before the leafs come down! They are guaranteed to last for 20 years! We install Seamless Gutters, 1/2 Round Gutters and Copper Gutters.